Tariffs are the single most important economic tool to control individual resident’s water usage. Many apartments often bundle water charges into a single maintenance account. But this keeps the expense of water consumption invisible. RWAs must have a Cost Account for water separately. RWA Management Committees need to consider various parameters to arrive at the tariff. What cannot be measured cannot be managed. The first step is to measure water consumption and calculate the total cost for getting water into a resident’s flat. 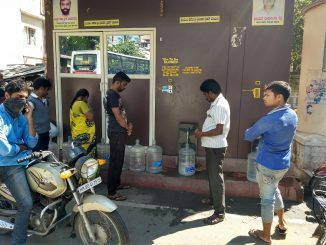 Where does Bangalore get its water from? What is the real production cost of water? First important point: Measure water, and electricity used for water i.e. source water meters, distribution water meters and consumption water meters, and separate electricity metering of all water pumping and treatment systems. Many communities are billing only the raw purchasing cost of water. They are not including the cost of water treatment, running motor pumps, etc into the tariff. The real cost of water supply is not known to residents. It instead gets accounted in the maintenance cost. Following points should be considered while fixing the tariff of water. Water infrastructure maintenance sinking fund – costs for infrastructure refurbishments like replacing pipes when they are too old, or fixing motors when they get spoilt. This can be a slowly growing sinking fund. A slowly accruing fund for investments and maintenance of recharge, waste water reuse etc. This helps prevent borewells going dry. The two aspects are – expense on water procurement and treatment, and the subsequent sewage management. Water may be procured from borewells, municipal Cauvery water supply and/or tanker water supply. Apartments often have water treatment plants, which implies there is a cost of maintenance (Annual Maintenance Cost). Treatment plants also need a daily supply of raw material (salt) and daily labourer to do the regeneration process. Cost of treatment includes the maintenance cost of the STP plant, labour and the power consumption of the plant (e.g. A 140KLD STP uses up 250 units of power a day. In addition, water treatment cost includes maintenance/AMC cost, cost of raw material/salt etc, cost of labour and sewage treatment cost includes maintenance/AMC, cost of plant, pipe maintenance, power consumption and cost of labour. There is also the capital recovery cost. E.g if you had installed Rain Water Harvesting system. A component to raise funds for alternate sources (e.g. a new borewell) or for water security measures can also be added. Here’s a file that helps you in calculating the cost of water in your apartment. Tweak it based on the numbers in your apartment. Download here. There are many ways to measure the quantity of water you source. In apartments, it is difficult to measure how much water each resident consumes, because of the complexity of piping. Without measuring, you cannot really charge consumers the right amount. Meters work by measuring the flow of water. In apartments, jet meters are common mechanical options. For more information on water-metering, click here. For understanding water meters and how they are installed, click here. Metering the source: It is important to install meter to measure the water coming in from the borewell. For municipal water, it is anyways compulsory. For tanker water, it is critical to cross-verify the quantity of water actually being delivered. Metering distribution: Metering distribution helps to check if the pipes are leaking. Ensure that source meter readings, aggregate distribution meter readings and aggregate consumption meter readings match. If they don’t, it means there is leakage somewhere. Then it’s for you to identify and rectify it. Metering consumption: This is essential to ensure individual residents take responsibility for their own consumption. This will encourage people to value water and be careful in usage. Metering waste: This is to see if the STP can handle the waste output. Metering waste allows us to see and compare how much fresh water we consume and how much of that fresh water we throw out as waste. It enables us to understand and monitor the water cycle not just till consumption but after the consumption too. The real cost of water is the cost of not just getting it to our taps and showers, but leaving the water we have used back to nature in the same quality as we took from it. Tariffs are like control lever to ensure financial sustainability of operations of water and waste-water. Tariffs can create a fund for future expenses on water / water infrastructure that will be needed in times of major maintenance or crisis. Tariffs are the singlemost important economic tool to send out the signal to people that they should not waste water, they should use it prudently and frugally. i.e. Demand Management. It should send the message that responsible water users are rewarded and irresponsible water users are penalised. The water bill should be seen in the light of the above objectives of tariffs. It should not be merely a piece of paper which tells people how much money they should pay monthly – but it should communicate to them what is happening with water in the community. So get creative on how the bill can be a communication tool – get creative on how the bill is given to people, what the bill contains in terms of content, and how you use the bill as a feedback mechanism of what people are thinking in the community. Don’t bundle water charges into other charges. Can an increasing block tariff be imposed ? What is a reasonable consumption rate? Real consumption ranges from 50 to 300 liters per person per day. 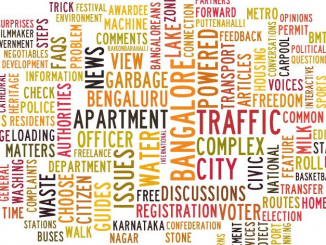 National Town Planning Norms provide for 135 LPCD in urban areas and 55 LPCD for rural (Karnataka). 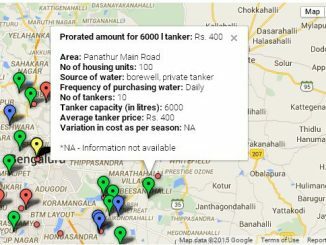 In February 2015 we collected data from citizens on how much they were paying for tanker water. Here are the results. All estimate/calculations are good but think of water source ,The source is cauvery,bore well and tankers.This all went wrong, demand is more supply is less.By this taker supplier hike the price.If any worst will come means all estimate/calculation will go wrong.Before construcion of apartments Think of long term water source, this will help peace fully.No water no life.